Grave-robbing. What kind of monster would do such a thing? It's true that Leonardo da Vinci did it, Shakespeare wrote about it, and the resurrection men of nineteenth-century Scotland practically made it an art. But none of this matters to Joey Crouch, a sixteen-year-old straight-A student living in Chicago with his single mom. For the most part, Joey's life is about playing the trumpet and avoiding the daily humiliations of high school. Everything changes when Joey's mother dies in a tragic accident and he is sent to rural Iowa to live with the father he has never known, a strange, solitary man with unimaginable secrets. At first, Joey's father wants nothing to do with him, but once father and son come to terms with each other, Joey's life takes a turn both macabre and exhilarating. 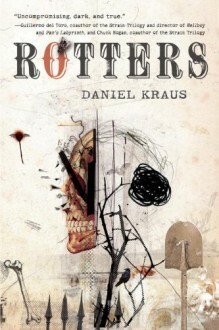 Daniel Kraus's masterful plotting and unforgettable characters make Rotters a moving, terrifying, and unconventional epic about fathers and sons, complex family ties, taboos, and the ever-present specter of mortality. I'm just too busy to try to force myself through this!